The Series 4B 1/4 DIN Temperature/Process Controller is designed to accept thermocouple, RTD, current or voltage input and provide dual outputs for control. Available outputs include relay/relay, voltage pulse/relay, current/relay, or linear voltage/relay. The units can be programmed for ON/OFF, PID, auto-tuning, or manual tuning control methods. The PID control is supported by 64 ramp/soak actions. The Series 4B also includes two additional alarm outputs. The second relay output can be reconfigured as a third alarm output. The alarm type can be selected from 13 different preprogrammed alarm functions. 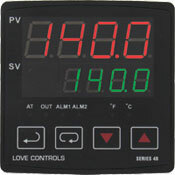 The controller features dual LED displays for local indication of process and setpoint values.